Château Mouton Rothschild, located in the commune of Pauillac in an area known as the Haut-Médoc lying to the north of the city of Bordeaux close to the Gironde estuary, is one of only five Premier Grands Crus Classés in this most famous of all wine-producing regions. Although long recognised by connoisseurs the world over as unquestionably the equal of the other four highest-ranked estates of Bordeaux (Ch. Lafite-Rothschild, Ch. Latour, Ch. Margaux and Ch. Haut-Brion) it wasn't until 1973 that Ch. 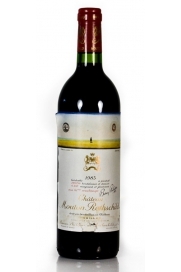 Mouton Rothschild was finally admitted to this exclusive club following a very long period of lobbying by its then owner Baron Philippe de Rothschild. 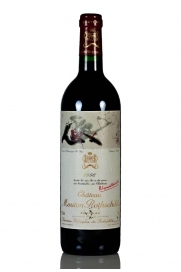 Château Mouton Rothschild produces superbly opulent, long-lived, Cabernet Sauvignon dominated red wine whose empty bottles have themselves become collectors' items due to the post-reclassification tradition of being adorned by labels designed by famous figures from the art world. In keeping with such a renowned Bordeaux wine the history of Château Mouton Rothschild goes back a long way. Its vineyards were first established in the early 18th. century when the estate was known as Château Brane-Mouton. Following its acquisition by Baron Nathaniel Rothschild in 1853 it was re-named Ch. 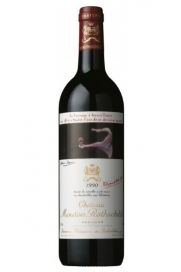 Mouton Rothschild according to the existing tradition when ownership of wine properties changed hands. Brane-Mouton had always enjoyed a reputation that was on a par with the other leading wine-producing estates of the Haut-Médoc although it had undergone a period of relative decline during the 1840s such that it in all likelihood made it a good investment at the time of its purchase by Baron Nathaniel Rothschild. This period of under-performance resulted directly in its classification as a mere deuxiéme grands cru classé in 1855 when the now famous Bordeaux classification was announced. Despite the subsequent improvement in Château Mouton Rothschild's reputation following this change of ownership it wasn't until 1922 when Baron Nathaniel's great grand-son Baron Philippe took over the running of the estate at the age of twenty that a wholesale modernisation was implemented that would revolutionise the wine industry in Bordeaux. Within two years he began bottling all of the estate's wines instead of the hitherto practice of selling the wine in barrel to be bottled by négociants who controlled the wine trade there. Such a move guaranteed both the authenticity and quality of the wine as it removed all possibility of adulteration by unscrupulous n&eacute;gociants. It could also conceivably be read as something of a snub to the n&eacute;gociant trade which had been largely responsible for drawing up the 1855 classification which placed Mouton Rothschild at the top of the second growths. This vintage was celebrated by commissioning the cubist artist Jean Carlu to design a special, commemorative label for the bottles. This radical move meant that a lot more storage space was needed and in 1926 Baron Philippe built the grand chai to house the barrels full of wine. In 1933 a neighbouring Pauillac estate, Château Mouton-d'Armailhacq was purchased (re-named Ch. 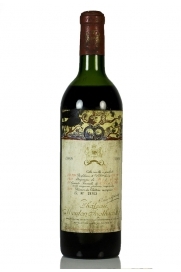 d'Armailhac in 1989), an acquisition that included a small négociant company that would be transformed into Baron Philippe de Rothschild S.A. and which would market more affordable wines including the now wildly successful Mouton-Cadet brand. 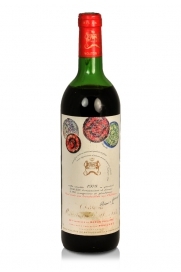 Three consecutive poor vintages in the 1930s resulted in only small quantities of Mouton Rothschild being produced and much of the rest went into the new branded wine blend. By the 1950s it had earned itself a reputation for being a solid, reliable and, above all, affordable everyday claret. The end of the Second World War saw a revival of the concept of artist designed label art with the 1945 vintage label being designed by a young unknown artist named Philippe Jullian and based on the theme of victory. Every vintage since then has been designed by a contemporary artist and the list includes such famous names from the art world as Georges Braque (1955), Salvador Dáli (1958), Henry Moore (1964), Joan Miró (1969), Marc Chagall (1970), Pablo Picasso (1973), Andy Warhol (1975), Keith Haring (1988), Francis Bacon (1990), Jeff Koons (1997) and Lucien Freud (2006) amongst many others. In 1962 the Château itself was converted into the Museum of Wine in Art, a major tourist attraction that houses a wealth of valuable objects associated with both wine and the vine. Baron Philippe de Rothschild achieved his life-long ambition when Château Mouton Rothschild was finally recognised as a First Growth in 1973 with then Agriculture Minister Jacques Chirac signing the decree. 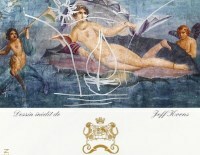 Mouton Rothschild had been a de facto First Growth but now it became officially recognised as such. The vineyard producing the grapes that make Château Mouton Rothschild encompasses 90 hectares of some of the most valuable land in the whole of the world's wine industry. It is situated at the northernmost part of the Pauillac appellation next door to Ch&acirc;teau Lafite-Rothschild. The proximity of these two world-class wine estates provides ample evidence of the importance of terroir and in particular the soil. Small differences in soil composition are reflected in big differences in a wine's character. Whereas Mouton Rothschild is full, voluptuous even and tougher in youth that of Lafite-Rothschild has more finesse and elegance. Some of the difference is down to the proportion of the different grape varieties used in each blend but the majority is terroir driven. Pauillac's geology consists of a mixture of gravel and sand several meters deep over a bedrock of clay and limestone. The soil itself is of very low quality unsuitable for the cultivation of any other crop but which is perfect for wine grapes. The general topography is low-lying with the occasional hillock or mound upon which the very best vines grow aided by the excellent drainage that the slopes provide. The vineyard of Mouton-Rothschild itself has a high point of 27 meters above sea level and sits atop the so-called Mouton plateau. Despite the depiction of rams as a theme running through the wine's labels and general iconography it is reckoned that the word "Mouton" actually derives from the old French word "mothe" or "mothon" with the meaning of "mound". It is in Pauillac that that the Cabernet Sauvignon grape achieves its most sublime expression resulting in wines which have tremendous power coupled with elegance, great fruit underpinned by rich tannins. The vineyard is planted in the ratio of Cabernet Sauvignon (81%), Merlot (15%), Cabernet Franc (3%) and Petit Verdot (1%) although each vintage having a slightly different character this exact proportion is not reflected in the final blend. The average age of its vines is 44 years although some are in excess of 100 years old. Vine density is high at 10,000 vine per hectare, concomitant with other elite Bordeaux producers, which forces the vines' roots to dig deep in the search for water and nutrients. Ch. Mouton Rothschild was the first major Bordeaux estate to plant a high proportion of Cabernet Sauvignon, a practice begun in the 19th. century while it was still known as Brane-Mouton. 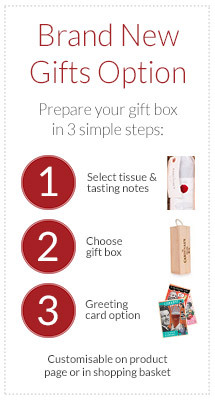 This practice has since been adopted throughout the Médoc. It always dominates the blend for the final wine as it is supremely suited to the gravel and sand soil providing fruit, tannin, power and longevity. Vineyard management is very labour intensive with groups of workers responsible for the same parcels each year. Depending on the vintage a "green harvest" takes place in July to concentrate flavours into the healthiest looking bunches of grapes. 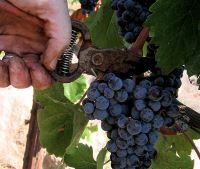 Grape picking is conducted entirely manually with the bunches being kept in open crates holding 12 kilos of fruit each. The youngest vines are always harvested first and are vinified separately as well. Once in the chai the bunches of grapes are placed on the sorting table where they undergo de-stemmimg and an inspection which rejects any damaged berries. From here the bunches are placed in bins which then gravity-feed the fermentation vats thus avoiding any unnecessary bruising and premature oxidation of the grapes. Altogether there are 64 225 hectolitre fermentation vats at Mouton Rothschild; 44 are made of oak (uncommon these days in Bordeaux), complete with transparent staves to monitor the fermentation process more effectively, with the remaining 20 being stainless steel. Each vat is used to ferment a particular parcel, a practice which facilitates the blending, or assemblage, of the final wine. 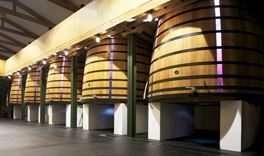 The malo-lactic fermentation takes place in tanks in the spring following the harvest after which the wine is matured in new French oak barriques for a period of between 18 and 22 months. Fining is carried out using the traditional egg-white method. The barrels are moved to the second year chai where they rest until assemblage and bottling. A second wine, Le Petit Mouton was first produced in 1993 and there is also a third wine which is sold as Baron Nathaniel. Approximately 40% of the harvest is destined to become part of the grand vin a figure which translates to about 20,000 cases per year. Mention has already been made of Château Mouton Rothschild's full and voluptuous body and it is unquestionably the most extrovert of all the first growths. The word "flamboyant" is often used to describe its character. It is extremely dense and tannic in its youth and it is a great pity to drink this special wine before it has reached a certain level of maturity. In the best of vintages it is an opulent wine with an ability to develop and evolve for several decades. Commonly ascribed qualities are its profound cassis nose, a feature of Cabernet Sauvignon dominated wines but truly exemplary in Mouton's case, benchmark cedar wood and graphite notes along with tobacco leaf. On the palate the wine is full and sumptuous with an almost never-ending finish and it is reputed to really stand out at blind tastings of the top wines from Bordeaux. The very best vintages are: 2014, 2012, 2010, 2009, 2008, 2006, 2005, 2003, 2000, 1996, 1995, 1986, 1982, 1961, 1959, 1955, 1953, 1949, 1948, 1945, 1929 and 1928. Mouton Rothschild has made Aile d'Argent Bordeaux Blanc since the 1991 vintage. The vineyard plantings for this wine are Sauvignon Blanc (53%), Semillon (35%), Sauvignon Gris (11%) and Muscadelle (1%) at a density of 9,000 vines per hectare. 20% of the wine undergoes malo-lactic fermentation with 50% maturing in new oak. As a result this wine is rich and complex and has quickly earned itself a reputation for being one of the very best dry whites of the region. A very mature vintage from this leading Bordeaux estate. 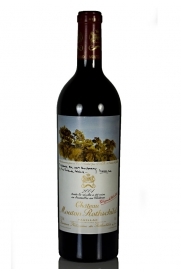 The Château Mouton Rothschild, Pauillac, 1996 is an extraordinary wine with many layers of flavours. This luscious Mouton Rothschild unravels as you drink it to reveal stunning notes mostly of blackcurrants, leather and oak but so much more is revealed as it evolves in the glass. An outstanding Mouton according to no less an expert than Robert Parker. Sheer beauty and enjoyment in a glass. 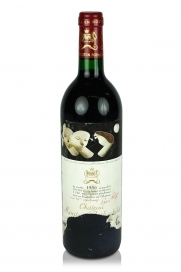 With a long time in the bottle this Château Mouton-Rothschild, 1968, has the potential to surprise with complexity and maturity. This Château has a great tradition of having its labels designed by famous artists and this vintage was designed by the French writer, poet and painter Bona.